Udi’s Bread: this, I buy at Whole Foods and freeze for weeks or months, so that I can stay out of Hole-in-the-Wallet. Sharp cheddar cheese: bought in bulk at Costco, for about 20% less. Bacon: also bought in bulk at Costco, precooked, so you don’t even have to pay for the power to cook it. Set your toaster oven to 375 degrees, and toast the bread for 3 minutes. Meanwhile, slice the cheese and tomatoes, wash the lettuce, and tear the bacon into bread-sized pieces. Once the bread is lightly toasted, remove from the toaster oven and arrange the bacon on one slice of the bread, putting the cheese on top. Put that slice back into the toaster oven and melt the cheese over the bacon for about 3 more minutes. Arrange the lettuce and tomato on the other slice of bread. 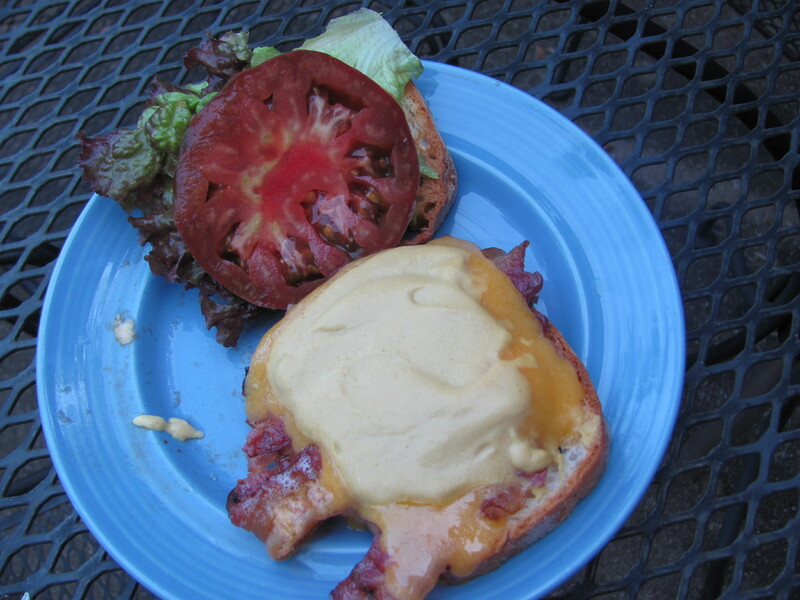 Remove the melted cheese toast from the toaster oven and slather with a lot of mustard. Also, it was so pretty I just had to take a picture. I’m now officially photographing almost every meal. Someone stop me.